CLOSE CALL can be performed for secondary schools, all year groups. The show can be performed at the schools themselves, for example in the gym or assembly hall. We can perform up to three times a day, for 150 pupils at a time. The show lasts around 45 minutes. After-show talks with the musicians are available upon request. A lesson plan related to the production is available for download here. With this you can prepare your class for content of the production they are about to see. preparation: it is essential that the pupils install the app CLOSE CALL LIVE beforehand, preferably trying it out too. The app is free and works on both iPhones and Android. Click on ‘app’ on this site for more information. On the day of the show it is important to not forget your telephone, and to ensure you have a full battery. bookings/finances: CLOSE CALL can be booked through Impresariaat Uit de Kunst. They also accept the Cultuurkaart. about the production: CLOSE CALL is an interactive concert where you can play along on your smart phone with an incomparable band with three drummers. Your telephone becomes a musical instrument that anyone can play through the app CLOSE CALL LIVE, not only as individuals but also when playing together. Loops with your voice, bass lines, raging solos, soft bleeps, heavy beats: it’s all there in your phone! At the same time, CLOSE CALL is about the relationship with your smart phone. Do you also check your phone 221 times a day? Could you imagine a life without your phone? In short: are you playing your phone, or is your phone playing you? See ‘info’ on this site for more information. 16-05-2019 12:00 De Doelen (Eduard Flipse zaal), Rotterdam. 16-06-2019 13:30 Fort Spijkerboor, Spijkerboor. 16-06-2019 15:00 Fort Spijkerboor, Spijkerboor. 23-06-2019 Fort bij Edam, Edam. CLOSE CALL | Stichting Goed Bezig! 12-12-2018 20:15 De Domijnen Sittard. 30-11-2018 20:30 De Kunstmin Dordrecht. 04-11-2018 14:30 De Veste Delft. 23-09-2018 15:00 Fort Waver-Amstel Waverdijk 19 Waverveen. 18-09-2018 9:00 Verkadefabriek Den Bosch. 15-09-2018 20:00 Fort aan de Ossenmarkt Ossenmarkt 1 Weesp. 11-07-2018 10:00 Over IJ college Amsterdam. 08-07-2018 15:00 Fort bij Nigtevecht Velterslaan 1 Abcoude. 07-07-2018 16:00 Fort aan de Drecht Grevelingen 30 Uithoorn. 02-02-2018 12:10 De Amersfoortse Berg Hugo de Grootlaan 25 3818 TA Amersfoort. 30-01-2018 10:00 Posttheater Rosendaalsestraat 27 6824 CA Arnhem. 14-09-2017 10:30 Metameer Stationsweg 5 5831 Boxmeer. 07-09-2017 11:00 Utrechts Stedelijk Gymnasium Ina Boudier-Bakkerlaan 7 3582 VA Utrecht. 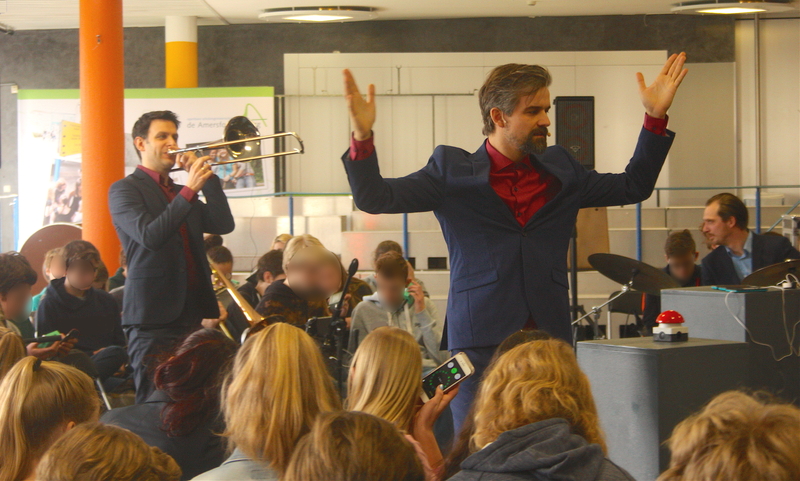 03-09-2017 12:00 Muziekhuis Loevenhoutsedijk 301 3552 XE Utrecht. In CLOSE CALL, your phone becomes a musical instrument. You are no longer a passive audience member but a musician, joining an infectiously energetic band with three drummers. Loops of your voice, solos, beats: with the special app CLOSE CALL LIVE anything is possible. Download and play along with the band, your phone can do more than you think! But then… your telephone is hacked and the app starts to live a life of its own. Are you playing your phone, or is your phone playing you? Do Facebook and Google have the right to know everything about you? Do you also check your phone 221 times a day? Do you suffer from dead battery anxiety? What effect does that have on you? The interactive concert CLOSE CALL makes your aware of issues like this in a unique way. You will feel the power of your phone like never before. The app CLOSE CALL LIVE is free to download in the App Store (iPhone) and Google Play (Android). Click on ‘app’ for more information and download links. Bring your phone to the concert, armed with the app and a full battery. CLOSE CALL is the new music production of composer Arthur Wagenaar (Susies Haarlok, Stads/Einder, Tafel van Vijf, Orkater). Your telephone can do so much more! With the CLOSE CALL LIVE app your telephone becomes a musical instrument. Download the app for free and play along. How does it work? At the top of the screen you can choose from three instruments. VOCO for loops with your voice, MELO for melodies and bass lines, and RITMO for beats. You can play by tapping the screen, but also by tilting and moving the phone itself! You can watch an instructional video below, or go to ‘help’ within the app. Or just start to play and discover it for yourself.